Sometime I like to shake it up and use fun patterns for my vinyl designs. 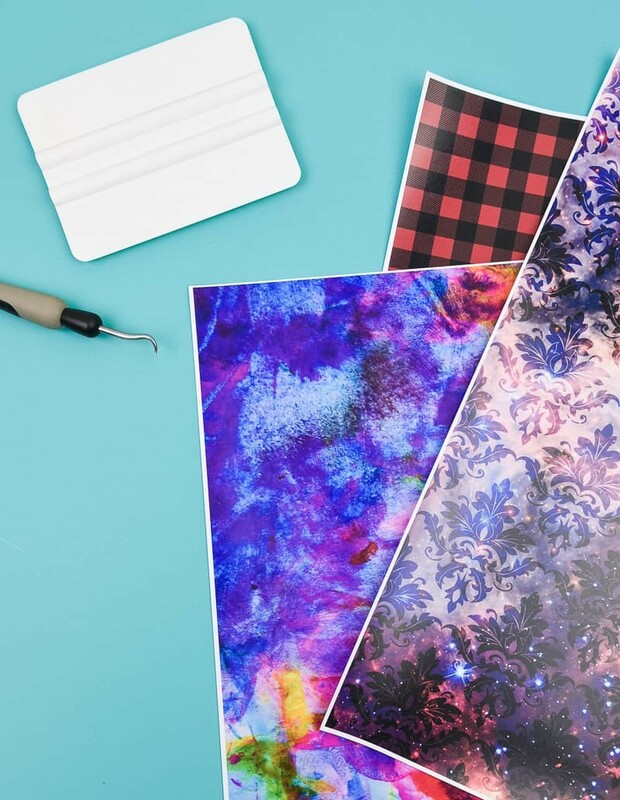 If you’ve ever wondered where crafters find all the cute patterns, I’ve got a list of my favorite Places to Buy Patterned Vinyl from for you! Sometimes I just want something different than a sheet of colored vinyl. Glitter is nice, I love flocked vinyl, and a simple color is great for some projects but sometimes I just want more. Because rainbow vinyl just looks better for certain projects. Patterned vinyl isn’t new but it’s something a lot of the mainstream vinyl stores (like Expressions Vinyl) don’t have. This type of vinyl is a pattern printed on to a piece of printable vinyl (you can do heat transfer or adhesive/permanent vinyl) and you can use it like you would any other type of vinyl! Expressions Vinyl does sell their own inkjet printable vinyl so you could make your own, or you could buy patterned vinyl from a shop (which is what I always do!). This mama is all about those shortcuts! To be honest I really haven’t tried a ton of adhesive/permanent patterned vinyl. I have one coffee mug with this mandala monogram on it that has lasted a few years now (it still looks brand new!) and a cookies for Santa plate that turned out cute, but other than that I’ve kind of stuck to heat transfer patterned vinyl. It’s not because I prefer one over the other, I just really like using patterned vinyl on shirts! So if you’ve been wondering where people are buying cute patterned vinyl and how to get your hands on some, I’ve got the perfect list for you today! Etsy is my go-to for a lot of things, but I just recently discovered that there are a ton of shops who sell printed vinyl! I should’ve figured out that I could get great quality printed vinyl on Etsy too. Some of my favorite websites that I buy patterned vinyl from also have shops on Etsy, but I’ve also discovered a few favorite shops just from browsing around. 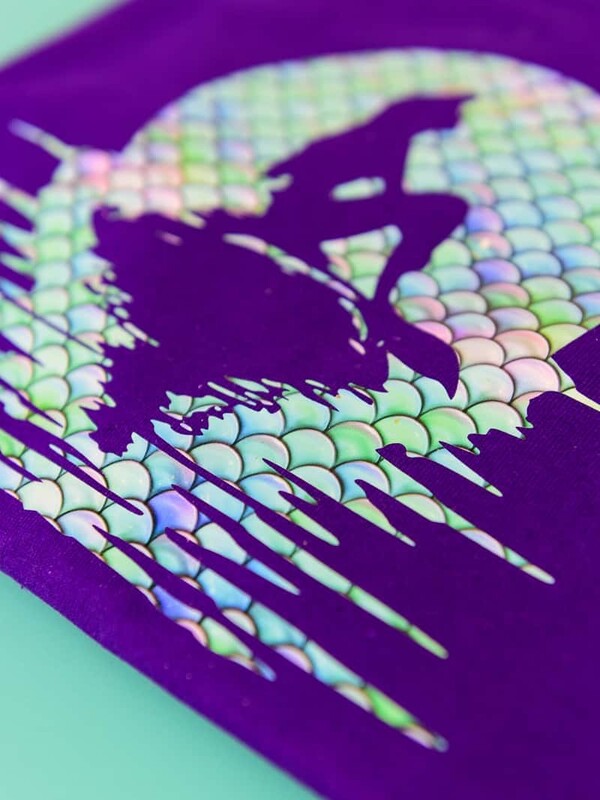 And if you love all things mermaid, you should check out the mermaid vinyl I’m obsessed with. Isn’t it gorgeous?! I’ve used and loved this seller for a long time and can’t recommend them enough. They have a Facebook group and a website to browse, though I recommend ordering through the website because the group can be a little difficult! I love so many of their patterns but this Bling pattern vinyl is by far my favorite (so pretty!)! And I actually made this monogram vinyl decal with their vinyl, which is my most popular post to date! I recently bought patterned vinyl from this store and I am so happy with it! I bought a few different patterns but this mermaid pattern that I used it for a Little Mermaid shirt was perfect! The shipping was also super fast and they were really easy to order from! They’re on Etsy but you can also order off their website too! Whether you need permanent vinyl, patterned, heat transfer, or foil you can find it all at Happy Crafters! They also have equipment like heat presses and accessories and blank t-shirts too. It’s so nice to be able to buy everything you need in one place. Plus there are a few cool (non-pattern) designs I want to work with. So many choices! This shiny heat transfer vinyl would be so pretty to work with! + Never mirror your design when cutting with heat transfer patterned vinyl! + To cut, put the pattern up on the mat (looking at you). + You do not need special cut settings, it’s the same as smooth vinyl (those are the settings you’ll want to use). + Heat Transfer Patterned Vinyl does not come with a carrier sheet on top of it (which is why you don’t need to mirror the design before cutting heat transfer vinyl). What I typically do is cut a design with regular htv and then use the carrier sheet from that project for my patterned vinyl. Check out some of my favorite vinyl projects! Sometimes patterned vinyl is just the better choice for projects. It gives everything a unique look plus it gives you an opportunity to use a new material and add something different to whatever you’re making. I love shopping for fun and unique patterns! Where is your favorite place to buy patterned vinyl for your projects? How does the patterned HTV hold up in the wash? I’ve been hesitant about using it because I don’t want to make my project then have the pattern fade after washing. It holds up well! I always wash mine on the gentle cycle and turn it inside out though, and always hang it to dry too. I’ve found sometimes (with regular HTV not patterned) that it can come off in the dryer so I just tend to be overly cautious and hang all of them to dry now. Hi Courtney! I actually did not purchase it. If you’re in Disney groups on fb (for the Cricut or Silhouette) you can find them there! Let me know if you need group recommendations, I have a few good ones! Hi Teresa! 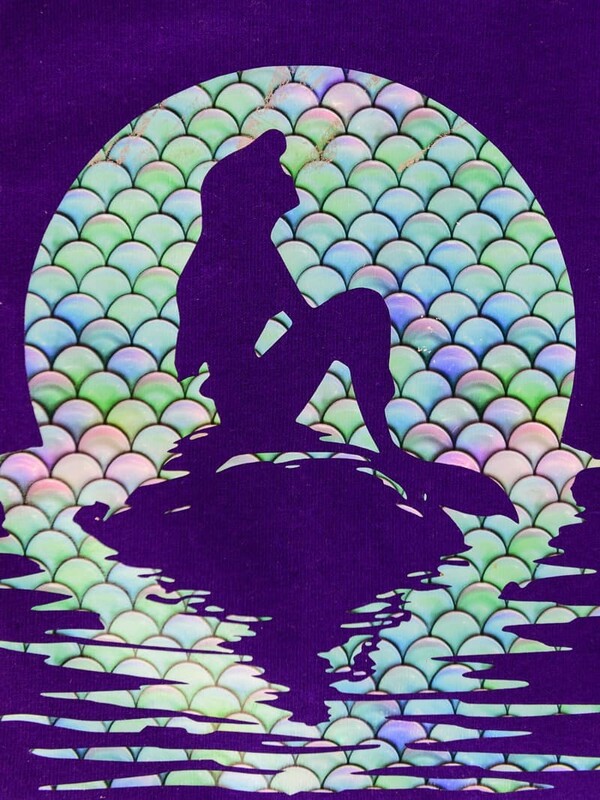 Unfortunately I cannot since it’s Disney’s intellectual property but if you want to make it for yourself you can google search a coloring page of Ariel and use that for your inspiration! Hi Dawn! Can you elaborate a little more on your problem? Do you have the 12×12 mat and page size selected for your machine? And are you using a Portrait or a Cameo? The Portrait only lets you cut up to 10″ wide. New Chance Vinyl: You have recommended this site for printed vinyl. You should read all the bad reviews on her Facebook page. You may want to rethink recommending this company. Hi Susan, thank you for your comment! I have been shopping with New Chance Vinyl for a few years now and have never run into any issues. But I will say that I encourage others to do research on stores before they buy from them, especially if they are a first time buyer! Thank you again for taking the time to comment and let me know your feelings about the company. Have a wonderful day! Where do I find the galaxy damask print that’s shown throughout your article?? I’m in love with it!